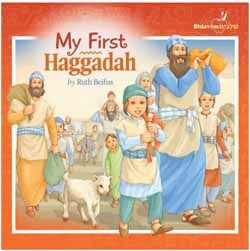 With all the many Haggadahs out there for adults and older kids, not much is available for our very young children. Now, at long last, our little ones have a Haggadah of their own. In My First Haggadah, the story of Yetzias Mitzrayim is told over by way of lots of beautiful pictures, and just a bit of explanatory text. Your child will beam with pride at the Pesach Seder with My First Haggadah at his or her side!